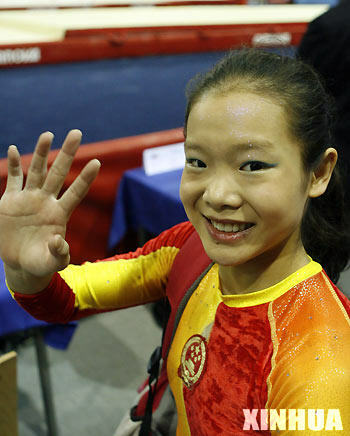 China View reported today that five-time world champion Cheng Fei (vault, vault, vault, floor, team) will not be vying for one of the all-arounder’s spots on the 2008 Chinese Olympic team. Cheng’s 2008 status is already set — according to China View’s article, she’s team captain. What was less clear was that she’s been training bars at all. Shocking as it is because the Chinese team as a whole is so good on bars, every now and again, the country produces an amazing gymnast who’s just not capable of their standard of bar work. Kui Yuanyuan was one. Cheng, although she has a decent swing, lacks a lot of difficulty given the current code of points. Too bad. Given that she’s capable of performing an Amanar on vault, Cheng has a shot at the all-around in any international competition basically by default. Her beam routine would be fine if she’d just take out the back full. As for vault and floor, well, she’s fairly dominant when she hits. This entry was posted on November 29, 2007 at 6:26 am and is filed under Uncategorized. You can follow any responses to this entry through the RSS 2.0 feed. You can leave a response, or trackback from your own site. I fully support her decision- and I’m so pleased she had the courage to come out and say it… the Chinese gymnasts lives are so governed its surprising she was even allowed a choice in this… or maybe her statement was made with permission. She can win a lot more gold for China by remaining strong on the other three events. Perhaps it’d be better this way for now. I really hope she stays on after 2008 to do the AA, but from the looks of it, it isn’t possible. Longevity is never a trademark of Chinese Women Gymnastics.